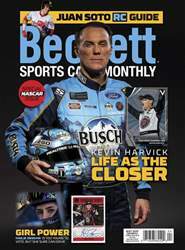 Bowman’s Best offers up a colorful take on chromium. While that comes through in the Refractors parallels, it’s also built into the design. 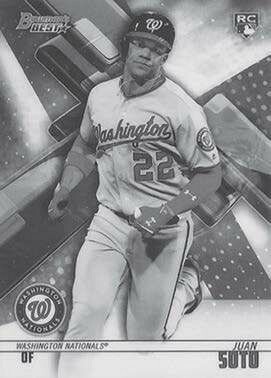 One of the final releases on the year, this Juan Soto Rookie Card might be overlooked in favor of the product’s autograph. You’re not going to find this card in packs of 2018 Donruss Baseball. Rather, it’s one of several products put in packs of 2018 Panini Chronicles. 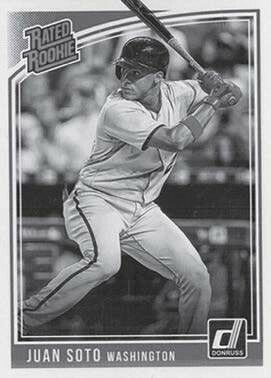 It’s one of a handful of new Rated Rookie cards that expand on the existing Donruss checklist.